Fatima-Zohra Imalayen (30 June 1936 – 6 February 2015), known by her pen name Assia Djebar (Arabic: آسيا جبار‎), was an Algerian novelist, translator and filmmaker. Most of her works deal with obstacles faced by women, and she is noted for her feminist stance. She is "frequently associated with women's writing movements, her novels are clearly focused on the creation of a genealogy of Algerian women, and her political stance is virulently anti-patriarchal as much as it is anti-colonial." Djebar is considered to be one of North Africa's pre-eminent and most influential writers. She was elected to the Académie française on 16 June 2005, the first writer from the Maghreb to achieve such recognition. For the entire body of her work she was awarded the 1996 Neustadt International Prize for Literature. She was often named as a contender for the Nobel Prize for Literature. Djebar was born Fatima-Zohra Imalayen on 30 June 1936 in Cherchell, Algeria, to Tahar Imalhayène and Bahia Sahraoui, a family of Berber origin. She was raised in Cherchell, a small seaport village near Algiers in the Province of Aïn Defla. Djebar's father was an educator, teaching the French language at Mouzaïaville, a primary school she attended. Later, Djebar attended a Quranic private boarding school in Blida, where she was one of only two girls. She studied at Collège de Blida, a high school in Algiers, where she was the only Muslim in her class. She attended the École normale supérieure de jeunes filles in 1955, thus becoming the first Algerian and Muslim woman to be educated at France's most elite schools. Her studies were interrupted by the Algerian War, but she later went on to continue her education in Tunis. In 1957, she chose the pen name Assia Djebar for the publication of her first novel, La Soif ("The Thirst"). Another book, Les Impatients, followed the next year. Also in 1958, she and Ahmed Ould-Rouïs began a marriage that would eventually end in divorce. Djebar taught at the University of Rabat (1959-1962) and then at the University of Algiers. In 1962, Djebar returned to Algeria and published Les Enfants du Nouveau Monde, and followed that in 1967 with Les Alouettes Naïves. She lived in Paris between 1965 and 1974 before returning to Algeria again. She remarried in 1980 to the Algerian poet Malek Alloula. The couple lived in Paris, where she had a research appointment at the Algerian Cultural Center. In 1985, Djebar published L'Amour, la fantasia (translated as Fantasia: An Algerian Cavalcade, Heinemann, 1993), in which she "repeatedly states her ambivalence about language, about her identification as a Western-educated, Algerian, feminist, Muslim intellectual, about her role as spokesperson for Algerian women as well as for women in general." In 2005, Djebar was elected to France's foremost literary institution, the Académie française, an institution tasked with guarding the heritage of the French language and whose members, known as the "immortals", are chosen for life. She was the first writer from North Africa to be elected to the organization. and the fifth woman to join the Academy. Djebar was a Silver Chair professor of Francophone literature at New York University. Djebar was known as a voice of reform for Islam across the Arab world, especially in the field of advocating for increased rights for women. Djebar died in February 2015, aged 78. In 1985, she won the Franco-Arab Friendship Prize, for L'Amour la Fantasia. 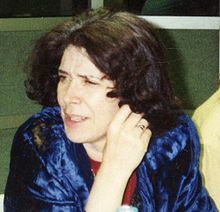 In 1996, Djebar won the prestigious Neustadt International Prize for Literature for her contribution to world literature. The following year, she won the Marguerite Yourcenar Prize. In 1998, she won the International Prize of Palmi. In 2000, she won the Peace Prize of the German Book Trade. On 30 June 2017 Google dedicated a Doodle to the novelist for the 81st anniversary of her birth. The Doodle reached all the countries of the Arab World. ^ Hiddleston, Jane. "Assia Djebar: In Dialogue with Feminisms (review)". French Studies: A Quarterly Review. 61 (2): 248–9. doi:10.1093/fs/knm041. ^ Alison Flood, "Assia Djebar, Algerian novelist, dies aged 78", The Guardian, 9 February 2015. ^ Combe, Dominique (2010). Asholt, Wolfgang; Calle-Gruber, Mireille; Combe, Dominique (eds.). Assia Djebar: littérature et transmission (in French). Presses Sorbonne Nouvelle. p. 280. ISBN 9782878544879. ^ a b "Assia Djebar", Voices from the Gaps, University of Minnesota. Retrieved 6 October 2013. ^ a b "Assia Djebar: Algeria's 'immortal' literary hero". Al Jazeera. 30 June 2017. ^ C. Naylor, Phillip (7 May 2015). Historical Dictionary of Algeria. Rowman & Littlefield. p. 210. ISBN 9780810879195. ^ a b Christopher John Murray (11 January 2013). Encyclopedia of Modern French Thought. Routledge. p. 181. ISBN 978-1-135-45564-4. ^ Mildred P. Mortimer (1988). Assia Djebar. CELFAN Editions. p. 7. ^ Ghaussy, Soheila (1994). "A Stepmother Tongue: "Feminine Writing" in Assia Djebar's Fantasia: An Algerian Cavalcade". World Literature Today. 68 (3). ^ MAÏA de la BAUME, "Assia Djebar, Novelist Who Wrote About Oppression of Arab Women, Dies at 78", The New York Times, 13 February 2015. ^ Jeune Afrique. Cidcom/Le Groupe Jeune Afrique. 2006. p. 16. ^ a b c d Chikhi, Beïda (2007). Assia Djebar: histoires et fantaisies (in French). PUPS. p. 186. ISBN 9782840505068. ^ "1996 Neustadt Prize Laureate - Assia Djebar". World Literature Today. Retrieved 2018-06-29. ^ "Assia Djebar's 81st Birthday". 30 June 2017. Retrieved 27 December 2017. Hiddleston, Jane. Assia Djebar: Out of Algeria. Liverpool: Liverpool University Press, 2006. Ivantcheva-Merjanska, Irene. Ecrire dans la langue de l'autre. Assia Djebar et Julia Kristeva. Paris: L'Harmattan, 2015. Merini, Rafika. Two Major Francophone Women Writers, Assia Djébar and Leila Sebbar: A Thematic Study of Their Works. New York: P. Lang, 1999. Mortimer, Mildred P. Assia Djebar. Philadelphia: CELFAN Editions, 1988. Murray, Jenny. Remembering the (post)colonial Self: Memory and Identity in the Novels of Assia Djebar. Bern: Peter Lang, 2008. O'Riley, Michael F. Postcolonial Haunting and Victimization: Assia Djebar's New Novels. New York: Peter Lang, 2007. Rahman, Najat. Literary Disinheritance: The Writing of Home in the Work of Mahmoud Darwish and Assia Djebar. Lanham, MD: Lexington Books, 2008. Ringrose, Priscilla. Assia Djebar: In Dialogue with Feminisms. Amsterdam: Rodopi, 2006. Thiel, Veronika. Assia Djebar. La polyphonie comme principe générateur de ses textes Vienna: Praesens, 2005. This page is based on the Wikipedia article Assia Djebar; it is used under the Creative Commons Attribution-ShareAlike 3.0 Unported License (CC-BY-SA). You may redistribute it, verbatim or modified, providing that you comply with the terms of the CC-BY-SA.